You might be familiar with dandelions growing rampant in your back yard, but did you know that those greens are packed with vitamins (A,C,E & more beta carotene that a carrot, just to name a few). They are also very bitter!! To cut some of the flavor-punch I blanched them briefly. Most sites will tell you to cook them for about 10 minutes, or until the stems are soft. 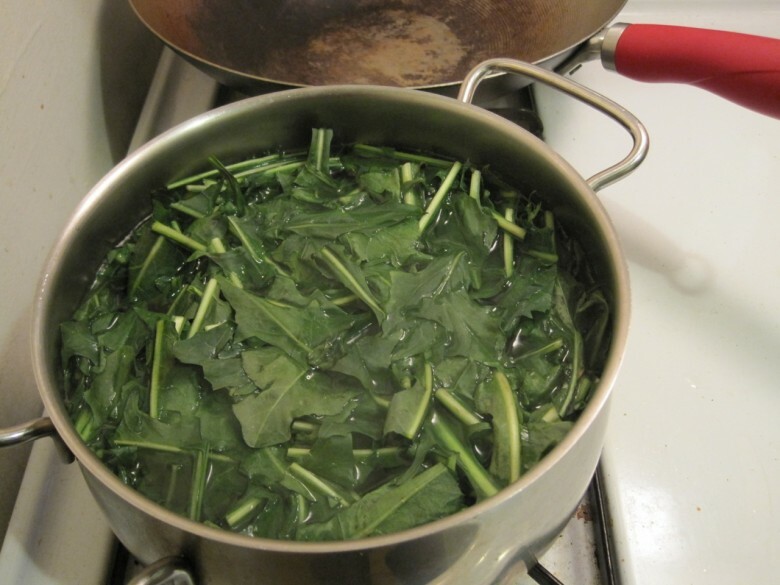 I don’t mind a bit of bitterness, and I wanted to preserve some of the vitamin content, so I just dropped the washed chopped leaves into a large pot of boiling water for about 5 minutes and then transferred them to a cool bath. Preheat the oven to 375 and then marinate the chicken for 30 minutes in a mixture of Greek Yogurt and Mixed Syrian Spices (which is a spice mixture I purchased from Sahadi’s which includes ground allspice, black pepper, coriander, nutmeg, cloves, and cardamom – in case you want to make it yourself), and some dried lemon thyme. 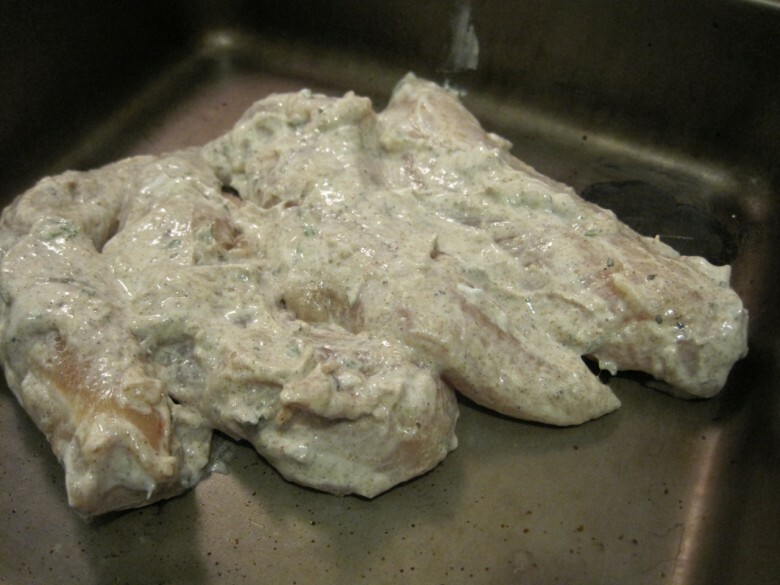 Yogurt has this magical ability (lactic acid and live cultures) to tenderize meats and chickens when used as a marinade. Since I typically end up constructing dishes out of ingredients I already have on hand, this dish was marinated in only a few tablespoons of yogurt – stolen out of the container I planned to eat with breakfast the next morning, shhhhh. 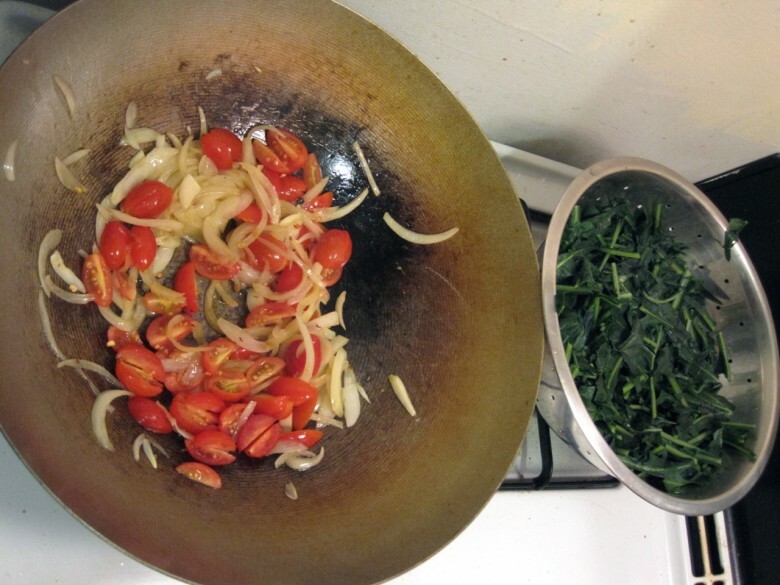 While the chicken is marinating and the leaves are boiling, quickly chop up an onion, a few cloves of garlic and some tomato. 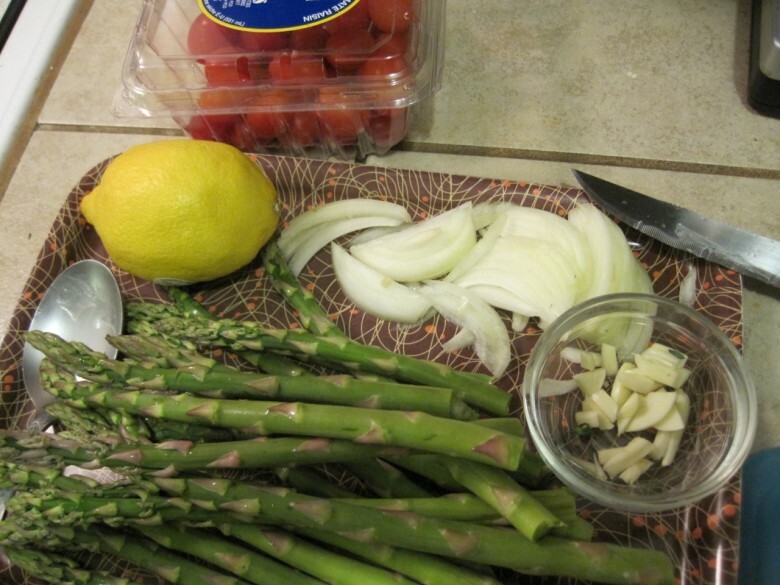 Wash a handful of asparagus and then, while holding the bunch in your hands, snap off the bottom portion of the stalk. Asparagus will naturally break where at the edible part of the stalk. Since the rest of the meal is bursting with flavors, simply steam the asparagus. When the pastina is done cooking, strain and then toss the cooked pasta in with the veggies and mix together over low heat. Drizzle a little more olive oil over the mix if necessary. Assemble the meal and serve with a wedge of lemon to enhance the flavors. 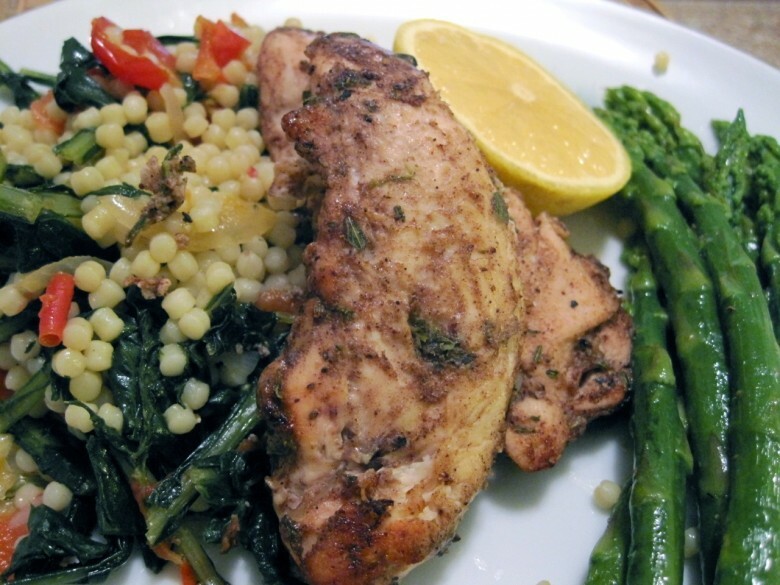 April 9, 2011 | Filed under dinner and tagged with asparagus, chicken, dandelion greens, dinner, pastina.